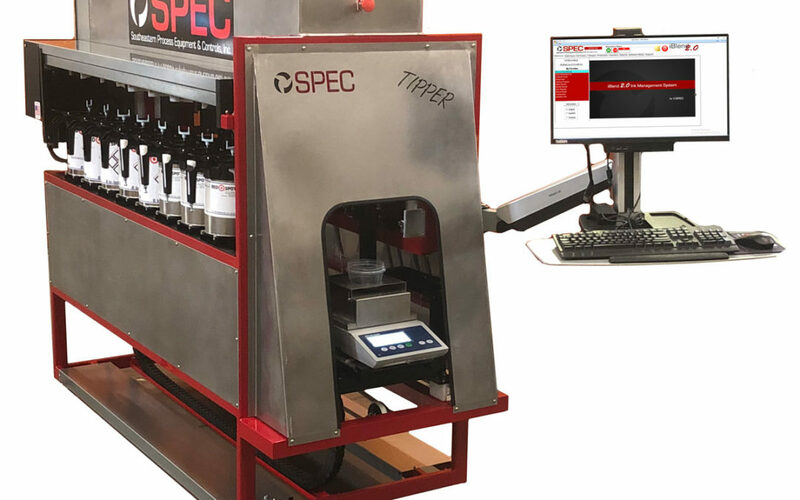 Dispense From 1-Gallon Cans with the Tipper | SPEC, Inc. The “Tipper” is the latest concept from SPEC. This fully automatic gravimetric dispensing system can house up to 16 base ingredients and provides the highest reliability, flexibility, and user-friendly operation available. The system handles everything from formula storage, to job scheduling, to batch dispensing, inventory control, production reporting and much more! With a small footprint of only 81”x67”x34”, the Tipper is perfect for small spaces or offices. The Tipper can make batch up to 500grams and has an accuracy of ±0.1grams! The system can be customized for UV/EB, water-based materials, class 1 division 1, or even class 1 division 2 areas. With the performance and reliability, you have come to know from SPEC, you can’t go wrong with this setup. SPEC has been providing automated dispensing solutions, mixers, shakers, custom software, and much more to manufacturing operations for close to 30 years. Over that time, we have earned a reputation for providing high quality systems with extremely reliable hardware, full featured, easy-to-use software, and support after the sale that is unmatched. Haven’t given SPEC a try yet, find out what all the buzz is about for yourself.